The Governess’s Secret Baby is a standalone story, but it is also the fourth and final book in The Governess Tales, a series about four friends who train as governesses at Madame Dubois’ School for Young Ladies and then head out into the world to earn their living. (See bottom of this page for more details of The Governess Tales). I loved bringing to life the gothic Shiverstone Hall, nestled below Shiver Crag in the Yorkshire Dales, and its reclusive, scarred and taciturn owner Nathaniel, Marquess of Ravenwell. Only a feisty heroine would do for Nathaniel, and Grace Bertram is certainly that: bold, impulsive and determined but also rootless and plagued with hidden self-doubt. Enjoy the emotional ups and downs as Grace helps Nathaniel find the courage to embrace life again, and Nathaniel proves to Grace she is capable of being loved. Here are the Harlequin and the Mills & Boon covers – aren’t they lovely? It’s my first Christmas cover and I couldn’t be more thrilled with it! NEWS! Since the Mills & Boon brand relaunch in January 2018, The Governess’s Secret Baby has been issued with a brand new cover (below)! “New governess Grace Bertram will do anything to get to know her young daughter, Clara. Even if it means working for Clara’s guardian, the reclusive and scarred Nathaniel, Marquess of Ravenwell! Nathaniel believes no woman could ever love a monster like him, until Grace seems to look past his scars to the man beneath But when he discovers Grace is Clara’s mother, Nathaniel questions his place in this torn-apart family. 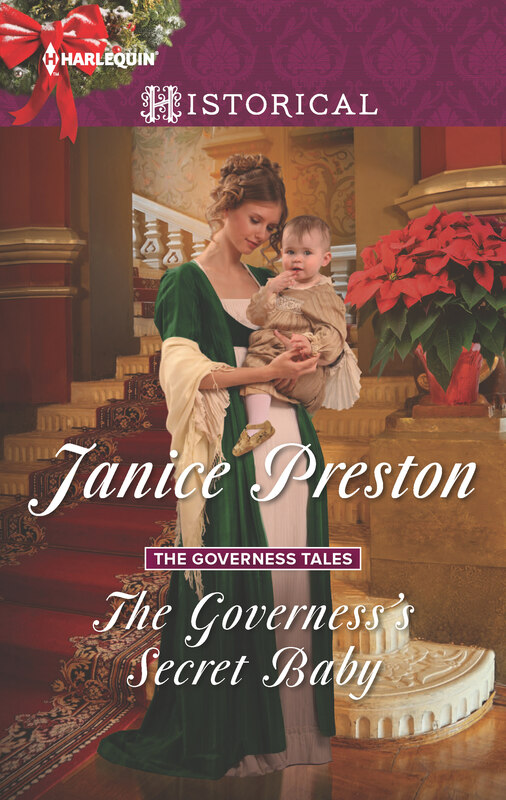 Read The Governess’s Secret Baby to find out, and to read the epilogue (set a year later) to discover what happens when Joanna, Rachel, Isabel and Grace – plus their new husbands and families – reunite for a special Christmas celebration. Sweeping romances with fairy-tale endings! Meet Joanna Radcliff, Rachel Talbot, Isabel Morton and Grace Bertram. These four friends grew up together in Madame Dubois’s school for young ladies, where they indulged in midnight feasts, broke the rules and shared their innermost secrets! But now they are thrust into the real world, and each must adapt to her new life as a governess. And each will meet her soul mate, who’ll give her the happy-ever-after she’s always dreamed of! Can’t wait to read this story by Janice Preston as I have loved all her other books. Her novels always combine gripping suspense, sexual chemistry and captivating characters in an authentic Regency atmosphere. Looking forward to this latest addition to her range. I’m pleased you enjoy my stories, Lynn, and I hope you’ll enjoy The Governess’s Secret Baby too!